For two magical nights I was able to capture the Rockies by moonlight, with the brilliant stars of winter setting behind the mountains. 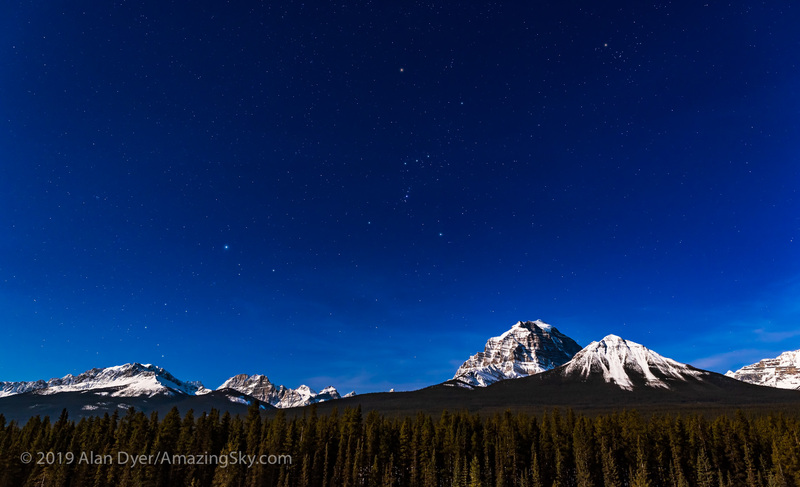 Back during my early years of shooting nightscapes I was able to capture the scene of Orion setting over Lake Louise and the peaks of the Continental Divide, with the landscape lit by the Moon. Such a scene is possible only in late winter, before Orion sets out of sight and, in March, with a waxing gibbous Moon to the east to light the scene but not appear in the scene. 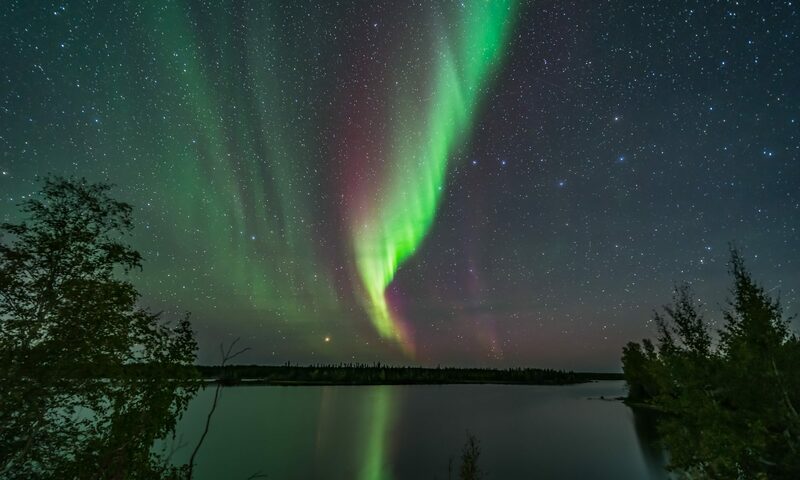 There are only a few nights each year the photograph is possible. Most are clouded out! Above is the scene in March 1995, in one of my favourite captures on film. What a night that was! But it has taken 24 years for my schedule, the weather, and the Moon phase to all align to allow me to repeat the shoot in the digital age. Thus the Challenge. Orion setting over the iconic Victoria Glacier at Lake Louise, with the scene lit by the light of the waxing Moon, on March 19, 2019. This is a panorama of 3 segments stitched with Adobe Camera Raw, each segment 8 seconds at f/3.5 with the Sigma 24mm Art lens and Nikon D750 at ISO 800. Unlike with film, digital images make it so much easier to stitch multiple photos into a panorama. In the film days I often shot long single exposures to produce star trails, though the correct exposure was an educated guess factoring in variables like film reciprocity failure and strength of the moonlight. Below is an example from that same shoot in March 1995. Again, one of my favourite film images. This year, time didn’t allow me to shoot enough images for a star trail. In the digital age, we generally shoot lots of short exposures to stack them for a trail. Instead, I shot this single image of Orion setting over Mt. Temple. The winter stars of Orion (centre), Canis Major (left) and Taurus (upper right) over Mt. Temple in Banff National Park. This is from the Morant’s Curve viewpoint on the Bow Valley Parkway, on March 19, 2019. Illumination is from moonlight from the waxing gibbous Moon off frame to the left. This is a single 8-second exposure at f/3.2 with the 24mm Sigma Art lens and Nikon D750 at ISO 800. Plus I shot the panorama below, both taken at Morant’s Curve, a viewpoint named for the famed CPR photographer Nicholas Morant who often shot from here with large format film cameras. Kevin Keefe of Trains magazine wrote a nice blog about Morant. A panorama of Morant’s Curve, on the Bow River in Banff National Park, with an eastbound train on the CPR tracks under the stars of the winter sky. Illumination is from the 13-day gibbous Moon off frame at left. 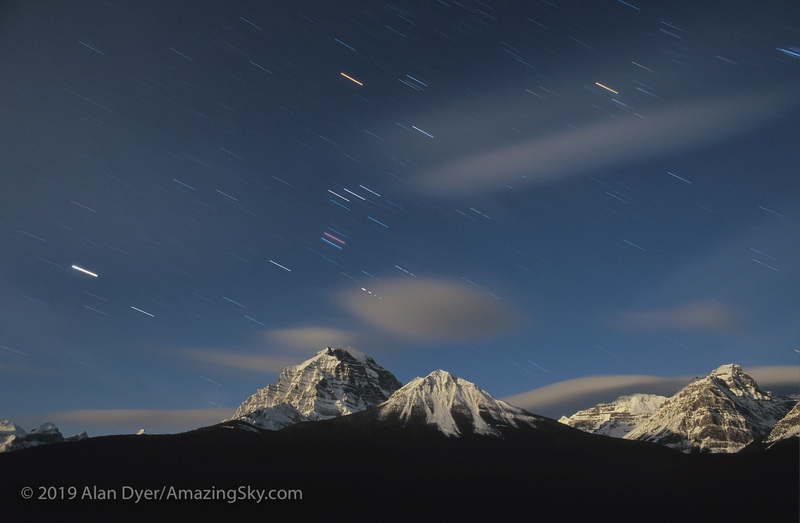 Each segment is 8 seconds at f/3.2 and ISO 800 with the 24mm Sigma Art lens and Nikon D750 in portrait orientation. I was shooting multi-segment panoramas when a whistle in the distance to the west alerted me to the oncoming train. I started the panorama segment shooting at the left, and just by good luck the train was in front of me at centre when I hit the central segment. I continued to the right to catch the blurred rest of the train snaking around Morant’s Curve. I was very pleased with the result. 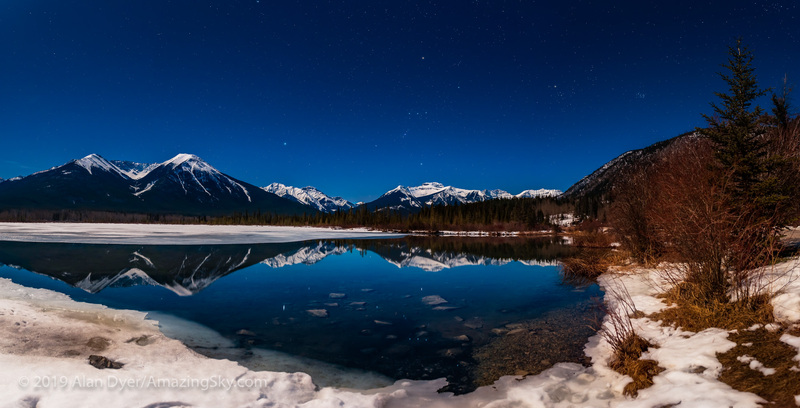 The night before I was at another favourite spot, Two Jack Lake near Banff, to again shoot panoramas of the moonlit scene below the bright stars of the winter sky. These are the iconic red chairs of Parks Canada, here at frozen Two Jack Lake, Banff National Park, and under the moonlit winter sky. This was March 18, 2019, with the scene illuminated by the gibbous Moon just at the frame edge here. This is a panorama of 11-segments, each 10 seconds at f/4 with the Sigma 24mm Art lens and Nikon D750 at ISO 800. 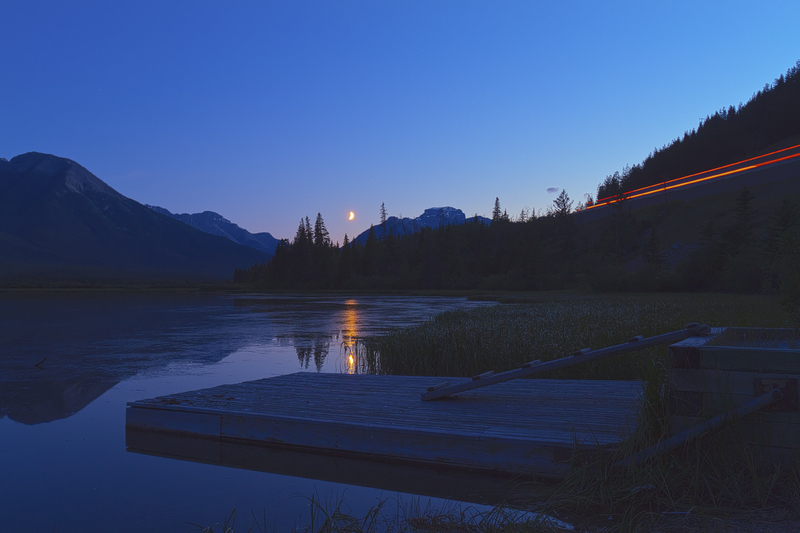 A run up to the end of the Vermilion Lakes road at the end of that night allowed me to capture Orion and Siris reflected in the open water of the upper lake. The winter stars setting at Vermilion Lakes in Banff National Park, on March 18, 2019. This is a panorama cropped from a set of 11 images, all with the 24mm Sigma Art lens at f/3.2 for 10 seconds each and the Nikon D750 at ISO 800, in portrait orientation. Unlike in the film days, today we also have some wonderful digital planning tools to help us pick the right sites and times to capture the scene as we envision it. This is a screen shot of the PhotoPills app in its “augmented reality” mode, taken by day during a scouting session at Two Jack, but showing where the Milky Way will be later that night in relation to the real “live” scene shot with the phone’s camera. The app I like for planning before the trip is The Photographer’s Ephemeris. This is a shot of the plan for the Lake Louise shoot. The yellow lines are the sunrise and sunset points. The thin blue line at lower right is the angle toward the gibbous Moon at about 10 p.m. on March 19. Even better than TPE is its companion program TPE 3D, which allows you to preview the scene with the mountain peaks, sky, and illumination all accurately simulated for your chosen location. I am impressed! Compare the simulation above to the real thing below, in a wide 180° panorama. 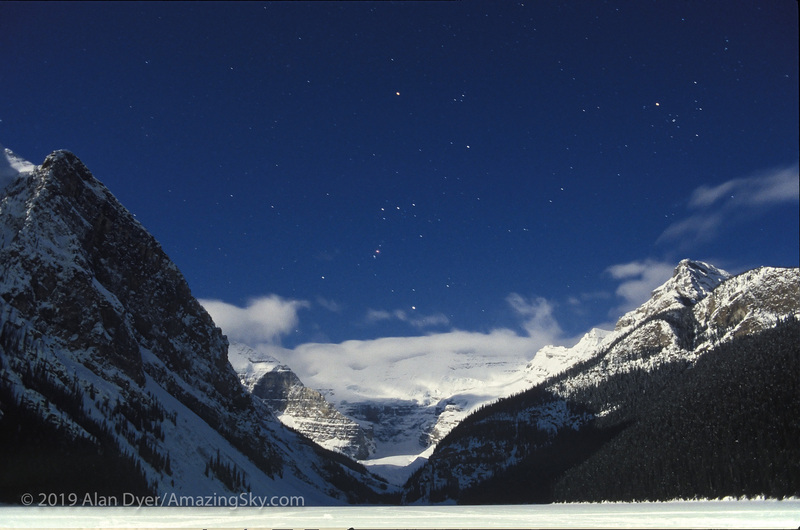 A panorama of Lake Louise in winter, in Banff National Park, Alberta, taken under the light of the waxing gibbous Moon, off frame here to the left. This was March 19, 2019. This is a crop from the original 16-segment panorama, each segment with the 24mm Sigma Art lens and Nikon D750, oriented “portrait.” Each segment was 8 seconds at f/3.2 and ISO 800. These sort of moonlit nightscapes are what I started with 25 years ago, as they were what film could do well. These days, everyone chases after dark sky scenes with the Milky Way, and they do look wonderful, beyond anything film could do. I shoot many myself. And I include an entire chapter in my ebook above about shooting the Milky Way. But … there’s still a beauty in a contrasty moonlit scene with a deep blue sky from moonlight, especially with the winter sky and its population of bright stars and constellations. These are the iconic red chairs of Parks Canada, here on the Tunnel Mountain Drive viewpoint overlooking the Bow River and Mount Rundle, in Banff National Park, and under the moonlit winter sky. This is a panorama cropped from the original 12-segments, each 15 seconds at f/4 with the Sigma 24mm Art lens and Nikon D750 at ISO 800. I’m glad the weather and Moon finally cooperated at the right time to allow me to capture these magical moonlit panoramas. It’s rare to get such a clear night in the mountains but I used the opportunity last Thursday night to shoot the Milky Way in a twilight scene in Banff National Park. I took this a little later on the same night as the previous blog’s image of the setting Moon. The location is the Vermilion Lakes, a familiar scenic spot for classic views of Banff and Mount Rundle reflected in the water, at far left. It is one of the few places in the mountains where you can look south over a low mountain skyline (to see the southern Milky Way) and over still water (to get reflections). For this shot I used a fish-eye lens to record most of the sky and the summer Milky Way arching over the water. The sky was dark enough to show the Milky Way but still had a lingering blue tint from the last glow of deep twilight. The yellow glow at left to the east is from the urban lights of Banff. 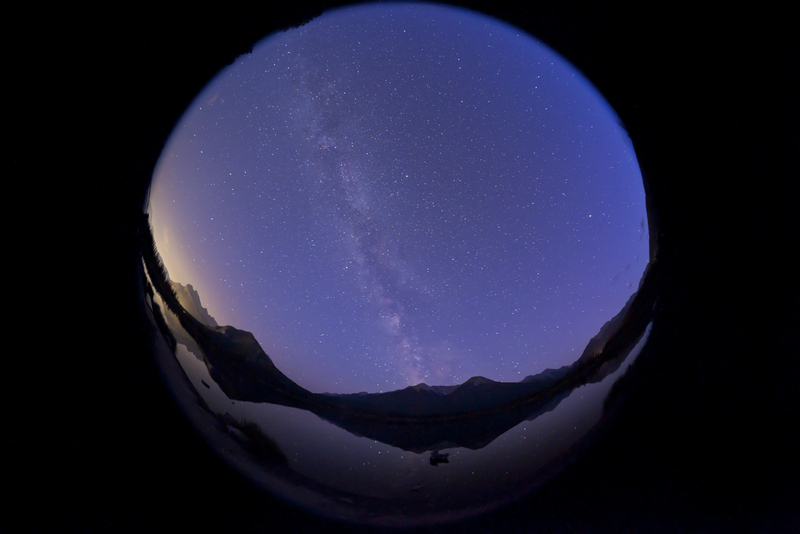 The still image is one frame of 220 shot over 4 hours for a time-lapse video, for projection in a full-dome video-equipped planetarium. Just so happens we’re building one in Calgary to open in early 2012. I’ve been chasing the Moon this week. I caught up with it last Thursday night, August 4, in Banff, with the waxing crescent Moon low in the southwest at dusk. The location is the upper Vermilion Lake just outside the Banff townsite. The golden reflection of the low Moon on the water, the slope of the mountainside and its reflection, the dock and steps, and the tail lights from a vehicle on Highway 1 just up the hill (I decided to leave them in!) make for what I think is an interesting composition of converging lines. I got set up and in position just in time to catch the scene at the magic hour of twilight, when the sky is dark enough the show deep colours and the Moon’s entire disk shows up, but before the sky gets too dark and the Moon too bright to make an interesting scene. Even so, the contrast in such a scene is still very high. So to capture it more as your eye would have seen it I used a stack of five exposures, taken in rapid succession, each 2/3rds of an f-stop apart. I then merged the frames with Photoshop’s High Dynamic Range routine to create a scene that brings out detail in the foreground without overexposing the Moon and sky. A technical method to capture a simple scene of serenity in the mountains.